This annual fundraiser combines two of our favorite things…NFL football and raising money for Special Olympics Iowa! For just $20, you have 8 chances to win each week of the regular NFL football season – that’s 17 weeks of play! Help us sell tickets too! We’ll send you a book of 25 tickets to sell. You do not need to pay anything up front. Just turn in the sold tickets and money as well as any unsold tickets by the deadline. Each raffle ticket will have three randomly assigned teams on it for each week of the NFL season (17 weeks). Each week, your three team scores are added together to determine the winners. (For example, if in week one you had Houston Texans, Kansas City Chiefs and Minnesota Vikings, the points they score will be added together for a total). If a team has a bye week, their previous week’s score is used. The highest scoring ticket each week will win $225, with payouts given through the eighth-highest, and to the third-lowest scores. Awards each week total $575! This ticket is unique and valid for the number of weeks purchased during this NFL football season. Each week three team scores are added together to determine the winners. If there is a tie, prizes will be combined and split equally. Individual winners will receive their prize money in the mail. If a team does not play in a given week, their score from the previous week will be used. Tickets are sold at random and not available for review until purchased. Each week is considered an independent raffle. It is not required to purchase the entire 17 weeks. 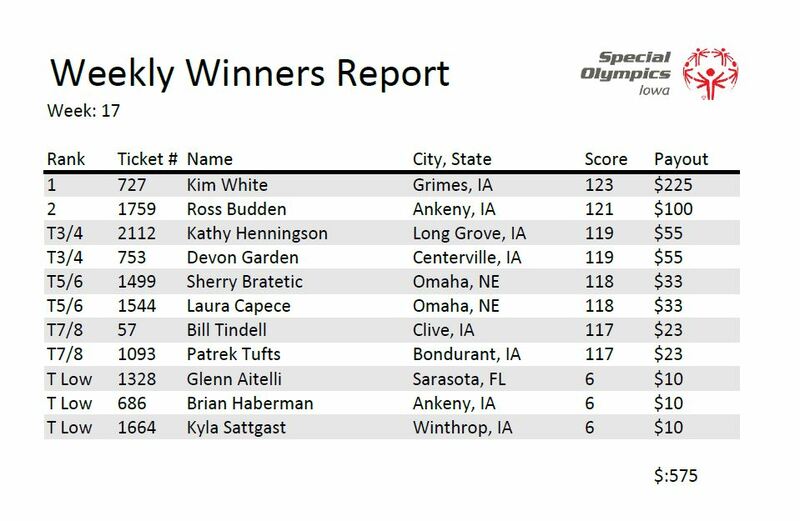 Anyone purchasing individual weeks or a partial packet of 17 weeks must contact the Special Olympics Iowa office for details. Decisions of Special Olympics Iowa are final.